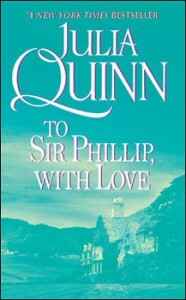 Not my favorite Bridgerton or Quinn novel. I feel like she's gone to the well of "compromising position so we must wed" too many times. Anthony continues to be my least favorite character in a romance. In history. Seriously jackass, you are not her father and you did the same! thing! I never fell in love with Phillip and his speech in the portrait gallery about how Eloise wasn't allowed to be unhappy because his last marriage was worse certainly didn't win him any points. I did like that he was a widower with children, which added a different wrinkle to the formula. I liked the scene where he and the brothers kiss and make up. Eloise doesn't read any differently from Daphne, which doesn't give me faith in the next book. In all, a humdrum effort.